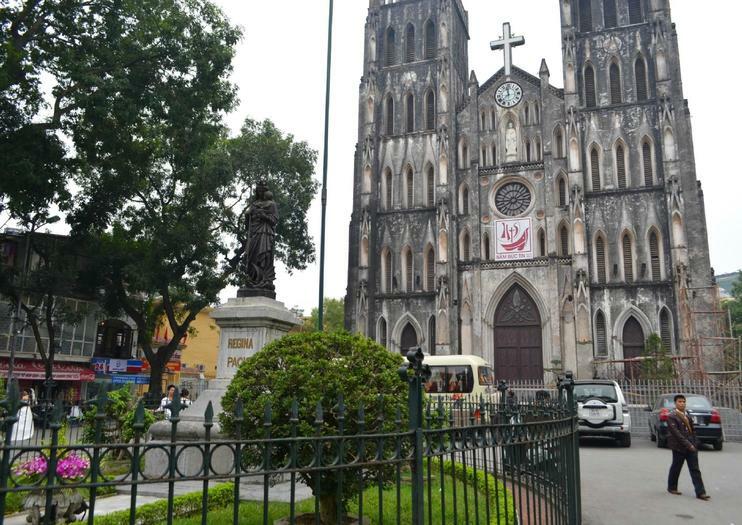 Located in Hoan Kiem district, the neo-Gothic St. Joseph’s Cathedral is the oldest Roman Catholic church in Hanoi and the headquarters of the Roman Catholic Archdiocese of Hanoi. Modeled after Notre Dame in Paris, St. Joseph’s Cathedral is one of the most famous and striking landmarks in Hanoi from the colonial era. Constructed between 1882 and 1886, St. Joseph’s Cathedral was consecrated on Christmas Eve, 1886. It was built on the site of the ancient Bao Thien Pagoda, which was demolished to make way for the church. It’s known for its soaring façade, twin bell towers, and a majestic interior with rib-vaulted ceiling, original stained glass windows, and elaborate altars. Although mostly European in design and look, there are some traditional Vietnamese decorations on the aisles, walls, and altars of the church. Mass is held several times a day, and is often crowded to overcapacity; those that wish to attend should consult the schedule that is sometimes posted outside the church. A number of sightseeing tours will feature a stop at St. Joseph’s Cathedral, along with other attractions like the Temple of Literature and Hoan Kiem Lake, and may include additional activities like a cyclo ride, a food tour, or a water puppet show. It’s free to enter the church, though donations are accepted. Enter through the side door, rather than the main entrance, except for mass. Mass is performed in Vietnamese and French. This is an active place of worship, so please be respectful of worshippers. St. Joseph’s Cathedral is located west of Hoan Kiem Lake, and can be easily reached on foot from most of central Hanoi. It’s easiest to take a taxi from elsewhere in Hanoi. Local buses, including buses 1 and 2, also stop nearby. The church’s opening hours tend to fluctuate, though it’s often closed for lunch. Services are performed throughout the week and weekend. The Feast of St. Joseph is celebrated on March 19. Christmas is a festive time to visit the church, and will have the biggest crowds. There are a number of boutiques, restaurants, and bars near the church. Hoan Kiem Lake is also nearby. This scenic lake is pleasant to walk around, and is home to Ngoc Son Temple, located on Jade Island, at the northern part of the lake. Take a ride on a ubiquitous means of transport in Vietnam: the scooter. Zip around the city on a half-day sightseeing tour of Hanoi, with your own personal guide in the driver’s seat. You’re introduced to Hanoi's daily life and food tastings at a restaurant. Visit the Hanoi Opera House, Temple of Literature, Ho Chi Minh Mausoleum, and Tran Quoc Pagoda, and St. Joseph's Cathedral in the Old Quarter and West Lake. Follow in the footsteps of one of Vietnam’s most famous men as you explore the streets of Hanoi once did on this small-group adventure tour. Pay a visit to the Temple of Literature and the notorious Hanoi Hilton prison. Follow your expert guide on a walking tour of the Old-Quarter and enjoy the expertise and knowledge that comes from being led by a local. Hanoi is a city famous for back streets, narrow lanes and bustling life behind the small alleyways, where buses, cars or motorbikes can’t drive through. Therefore, A Taste of Hanoi backstreet Bicycle Tour brings you the the best way to explore about this thousand years old city with our experienced guides.This is not only the most proper way for you to ride around and visit must-see sites of Hanoi, you also can learn a lot about our history, culture, lifestyle and people. Let us be your host for an adventure and unique travel experience! Spend three hours strolling the French Quarter during a private excursion that includes major landmarks in the Vietnamese capital. Your walking tour takes in the charm of Hoan Kiem Lake and French colonial buildings such as the Sofitel Metropole Legend Hotel and Hanoi Opera House. View government buildings, the National Museum of Vietnamese History and Museum of the Vietnamese Revolution. You’ll enjoy ‘pho’ (beef noodle soup) and have time for a stop at a sidewalk cafe or for Trang Tien ice cream. Explore vibrant Hanoi with a private guide on a full-day sightseeing tour that hits all the highlights of Vietnam's capital city. Visit the Ho Chi Minh Mausoleum, Temple of Literature and Vietnam Museum of Ethnology, in addition to sites such as One Pillar Pagoda and Ngoc Son Temple. You'll also attend a water puppet show and see the Old Quarter up close on a cyclo tour. Your tour includes a typical and tasty Vietnamese breakfast and lunch, plus Vietnamese coffee to start your day and a local beer to wind down. Hanoi has always been a long-history capital as well as a symbol of culture of Vietnam and a source of pride throughout the history. This Hanoi half day tour is designed to help you feel Hanoi's local culture while enjoying sightseeing highlights of an absolute and adorable Hanoi and enjoying a variety range of Vietnamese food. Hanoi is captivating with its mysterious beauty that is best taken in slowly. People said that: “You can’t leave Hanoi without knowing and having a sip of the famous Vietnamese coffee”. If you are a coffee enthusiast, don’t miss trying out a good cup of black, milk or even egg coffee in Hanoi. You can do this as easily as with a well-placed order in a roadside coffee shack, a cafe, or restaurant, but you can also go on a tour.Come with us to the most unique and well-hidden coffee spots in Hanoi while learning about this city’s culture along the way.